A young lady by the name of Faith Angelina has so much talent to offer the world. At a very tender age of 11 this amazing child wanted to end her life. I simply cannot fathom that. However, my own daughter was on a path of destruction when she was 16 and almost died starving herself (you can get her story here). Personally, I am a recovering alcoholic going on 35 years now so I can relate so much to these feelings that take a person to a dark and lonely place. 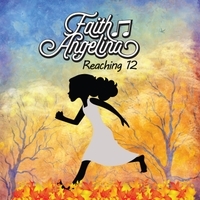 Faith Angelina is now 12 years old and her album Reaching 12 is a beautiful tribute to her path leading to a full enriched life via the ivory keys. Music is the universal healer and it can accomplish amazing things. I did not realize what this CD was about until I opened it up and read the liner notes. I found an immediate connection to this young lady and it made me very emotional. What turned it all around for her was the music and for me as a listener, based on my own life experiences, I was able to rejoice in her triumph. Reaching 12 is a story that celebrates her life and how she overcame the negativity and turned it all around. Again, I can relate to all of this in so many ways. The path to your answers are always within, sometimes they are locked away so tight they are hard to reach. With the realizations of the love and energies that surrounded her, she found her way back. What better way to convey this journey than through music? This music is beautiful and flowing like a stream of life gaining momentum with each successive track. Without words the story comes alive. There is so much more to this than the music. Although it is the focal point of one’s experience you have to look beyond all that. You must read the heart wrenching letter to her mother and the explanation of each track. Faith Angelina can help so many others through sharing her story and music. Through this music she found another purpose and a God given talent to share with the world. What a blessing you are Faith. Your story and music are amazing! Through these wonderful melodies, this bright young talent transmits a powerful message of hope and healing.